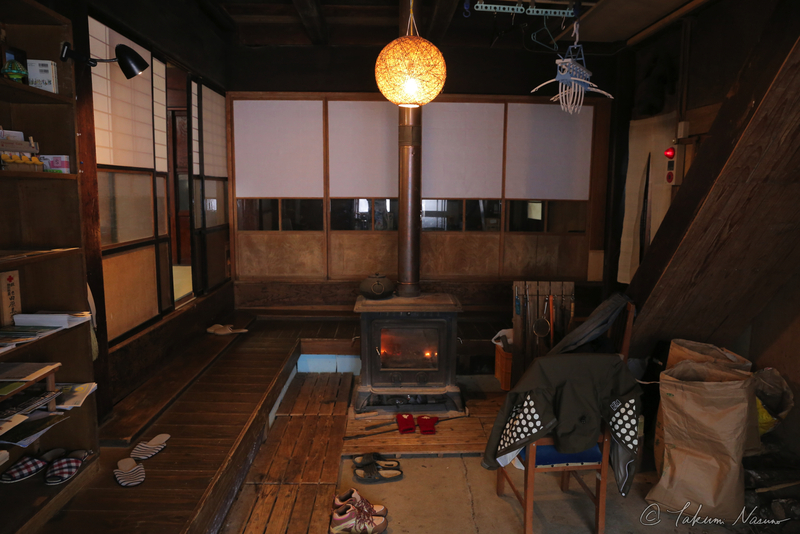 For those who are willing to experience daily lives in traditional Japanese houses in winter, KOZUENOYUKI Guesthouse can be one of your choices. Let's see 7 reasons why. 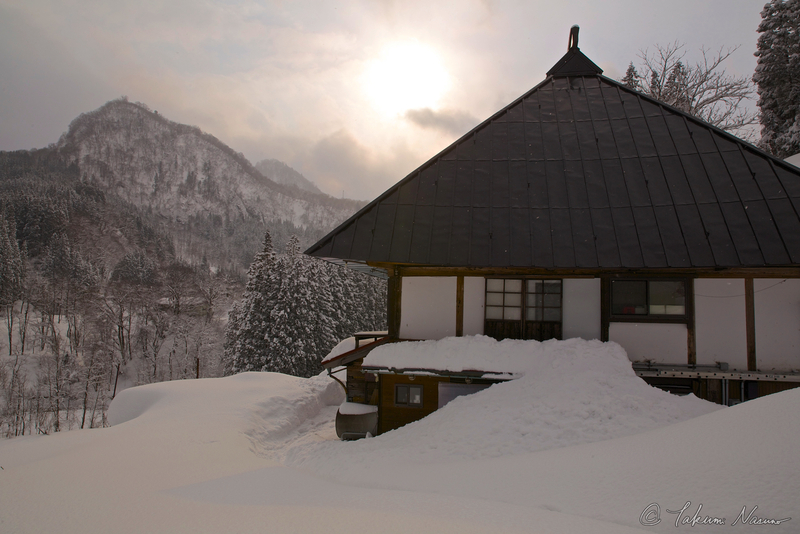 KOZUENOYUKI Guesthouse is located in Otari Village, the northern periphery of Nagano Prefecture. 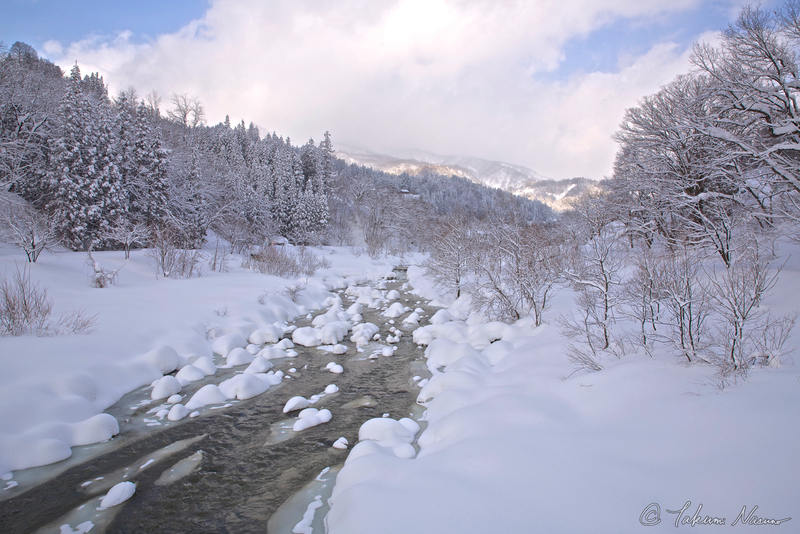 It's adjacent to Niigata Prefecture, and has plenty of snow there. Let's check the photo below. 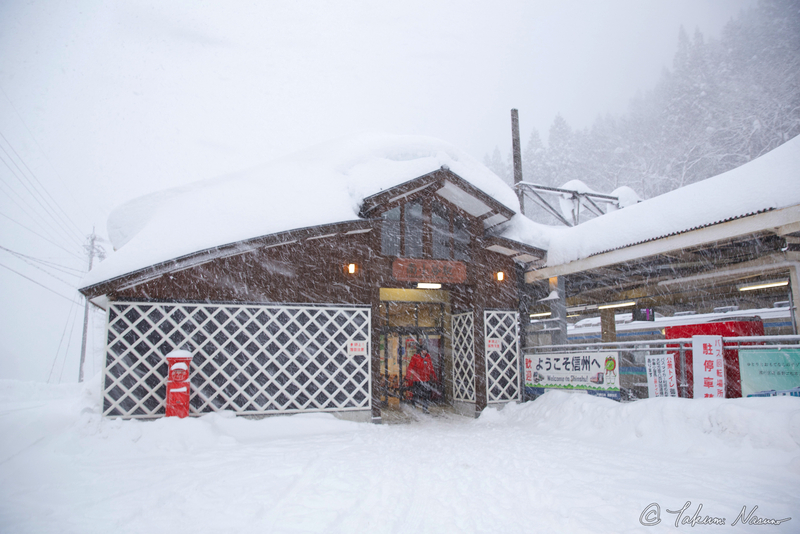 Minami-Otari Station, the center of the village, is having a lot of snow, or actually a snowstorm. To my surprise, they say this is usual for residents of Otari Village. 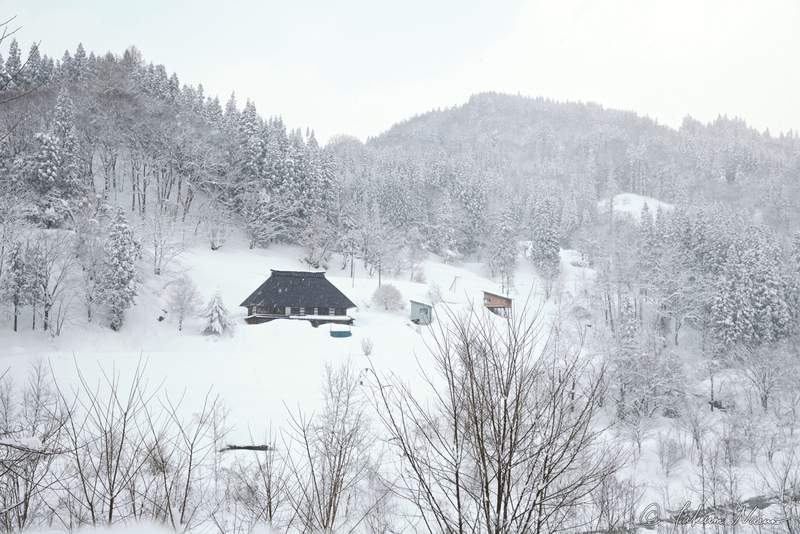 And of course, there are several ski areas around here - Tsugaike Kogen Ski Area, Hakuba Norikura Ski Area, and Hakuba Cortina Ski Area to enjoy skiing and snow boarding. 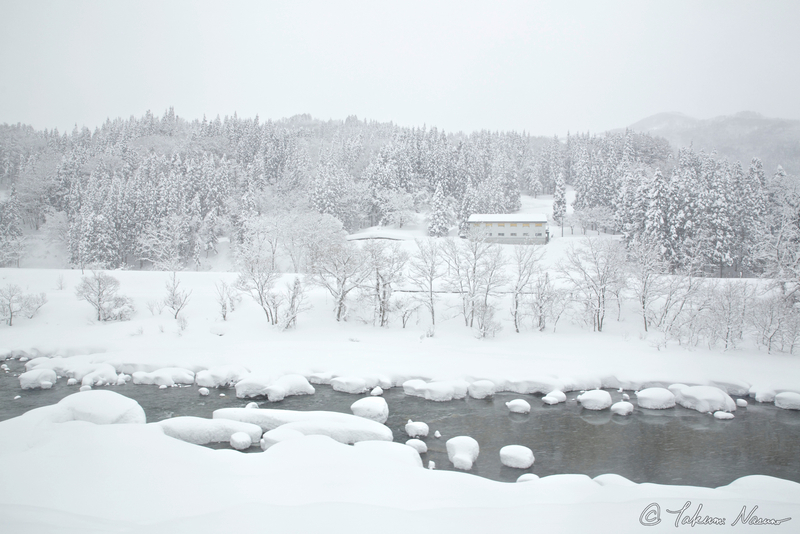 If you want to enjoy heavy snow, Otari Village must be one of your choices. Otari Village has an awesome river named "Hime River". 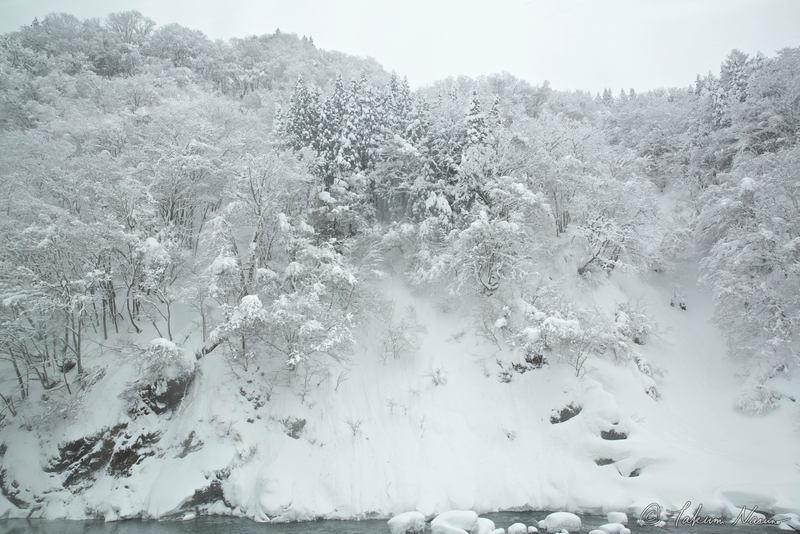 As the paved road goes along the river, you can enjoy this snowy river with various trees on all the way from Minami-Otari Station to KOZUENOYUKI Guesthouse. Very photogenic views are available all along the river. 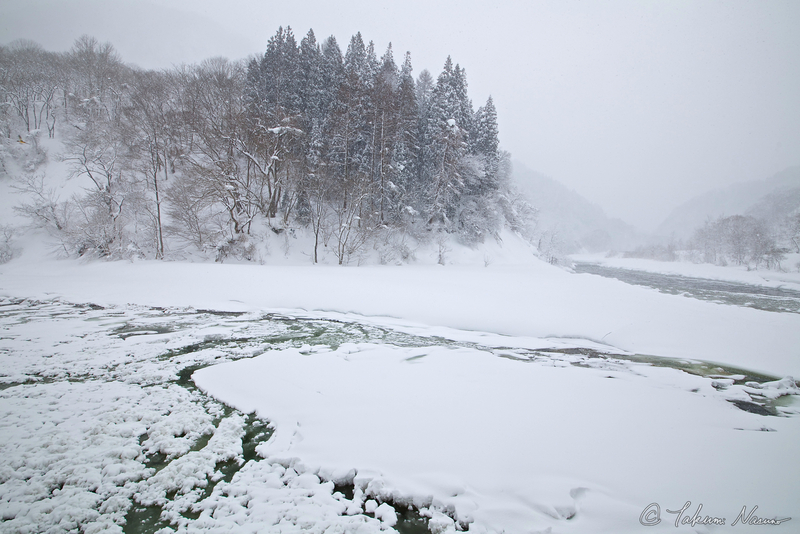 After crossing Hime River and cutting into mountainous area, you are ought to come across Nakaya River, one of the tributaries of Hime River. 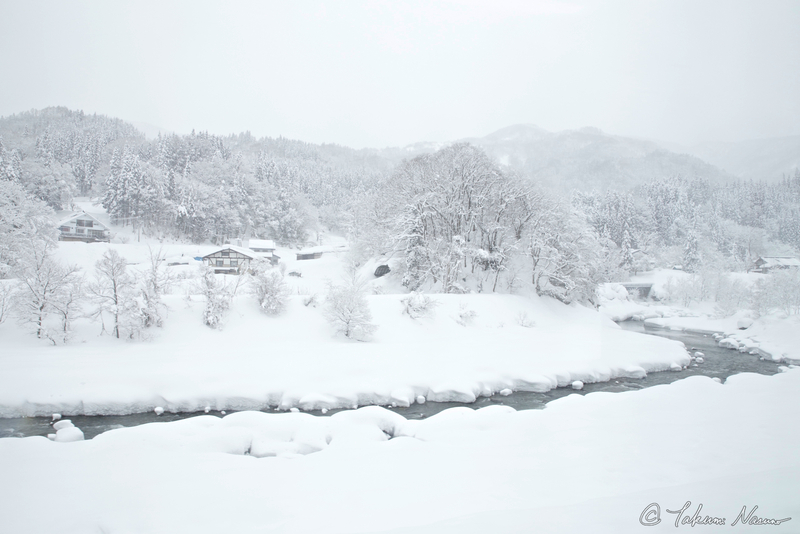 You can feel literally the black and white landscapes with faint differences in the white colors. 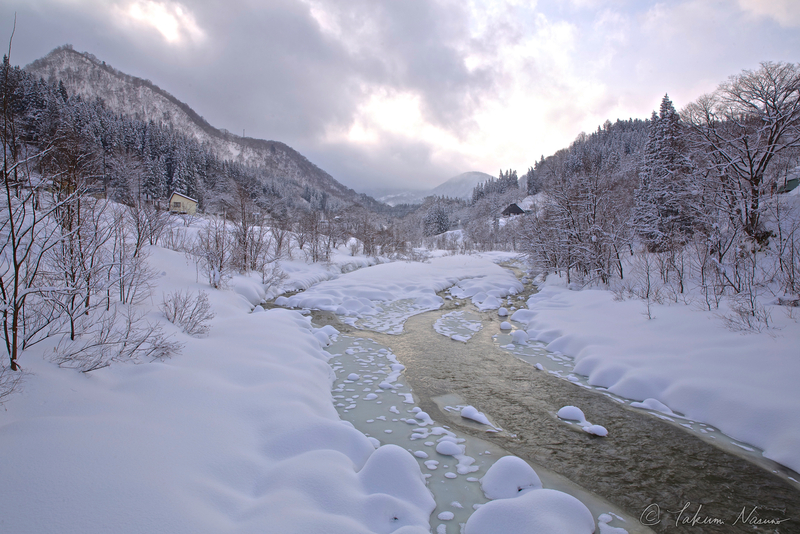 If you want to enjoy views of pure-snowy rivers, this is the place for you. You see the house with the black roof? This is KOZUENOYUKI Guesthouse. As you can easily find from the photo, it is on the hill, and offers you great snowy hillscapes from there. 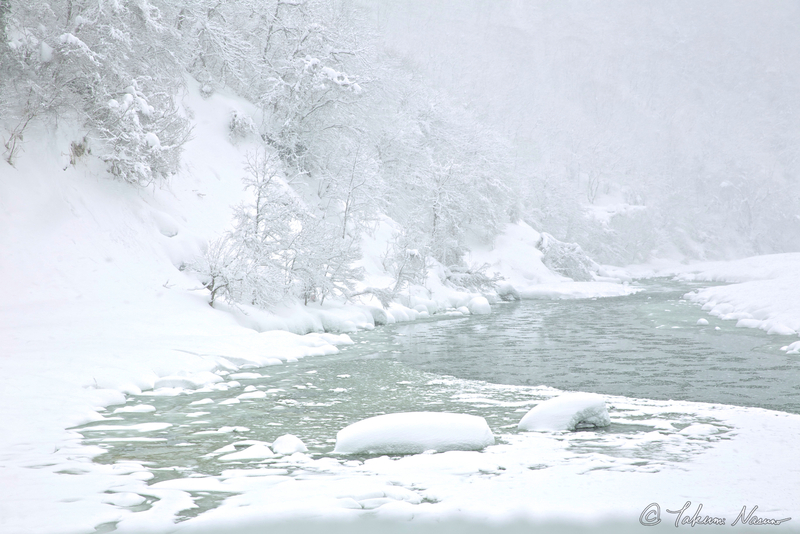 By looking at uncountable pieces of falling snow far and near, you can acquire a rich feeling of the three-dimensional open space in front of you. 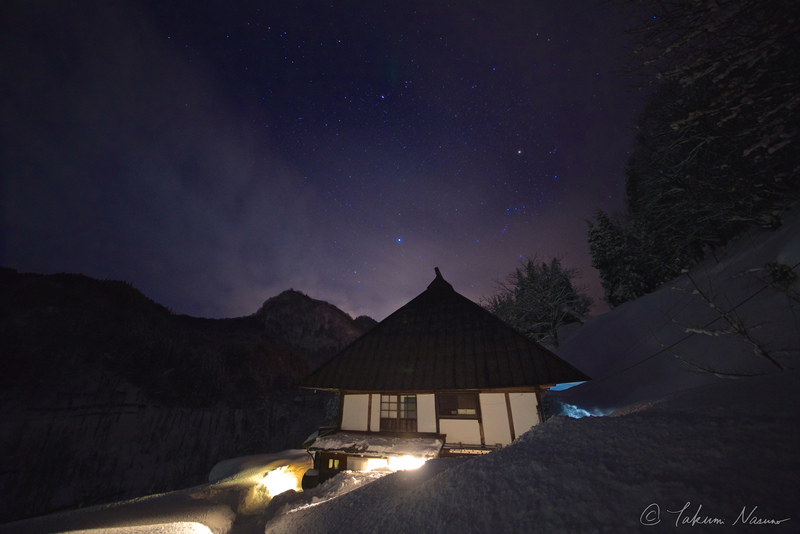 Although it snows a lot in Otari Village, clear sky is often available at night. 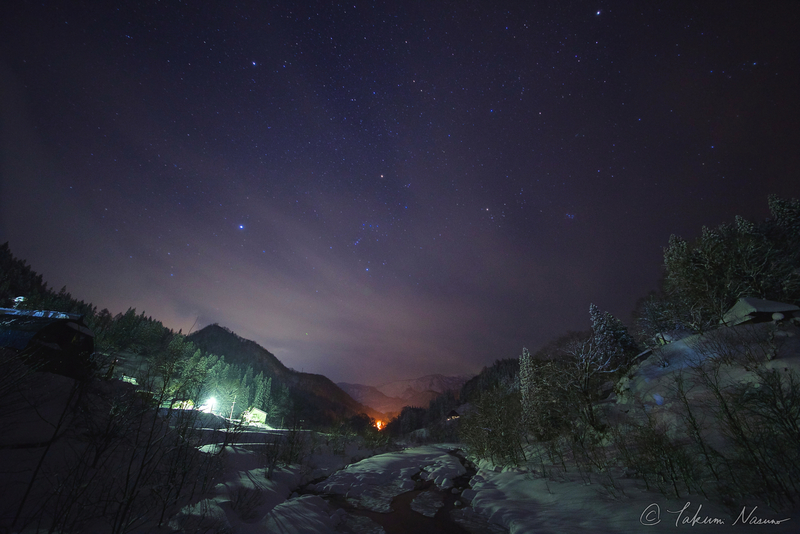 And then magnificent starscapes with mountains, snow and the river welcome you. And you see a black roof on the right side of the orange light, too? That is KOZUENOYUKI Guesthouse. And the next photo will let you understand what you can see from the guesthouse at night. From these photos, you must understand how great nature this guesthouse offers to you. 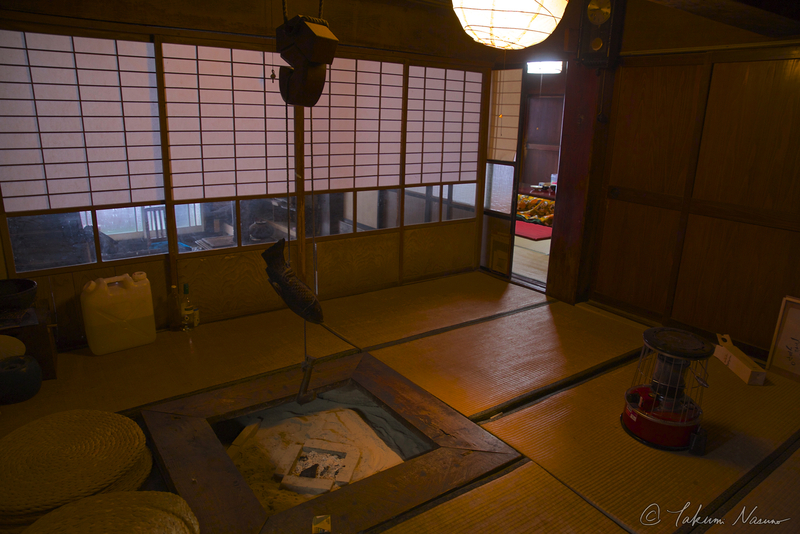 KOZUENOYUKI Guesthouse is a kominka guesthouse, or an old Japanese-style house guesthouse. 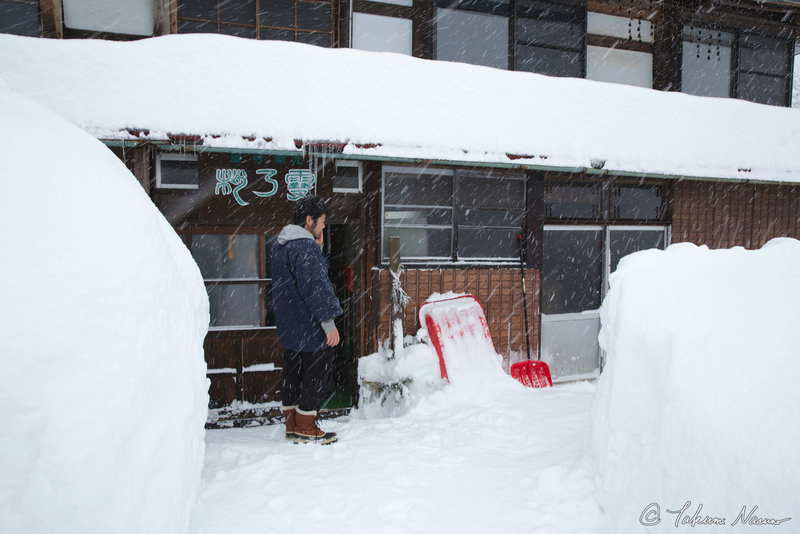 Once you enter the guesthouse, you will experience everything in snowy counties of Japan. 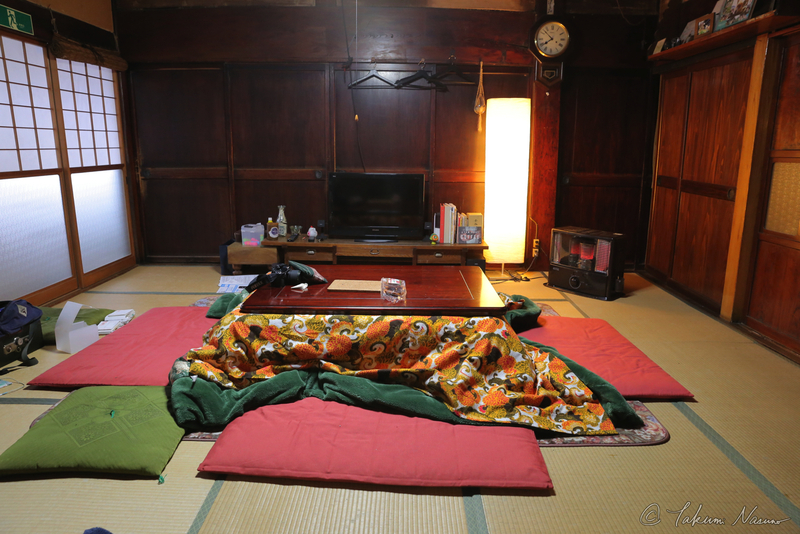 A wooden old house, a wood stove, a Japanese hearth (irori in Japanese), a Japanese foot warmer (kotatsu in Japanese), tatami mats, paper sliding doors (shoji in Japanese), Japanese beddings (futon in Japanese), etc, are all waiting for you. Are you tired of ordinary pensions and business hotels which are quite similar to the ones in other countries? Then, KOZUENOYUKI Guesthouse is the place for you. If you stay at this guesthouse, you are not welcome as a guest. But instead, you are welcome as a family member of KOZUENOYUKI Guesthouse. This means that for example, you cook together, you eat together, and you do the dishes together. 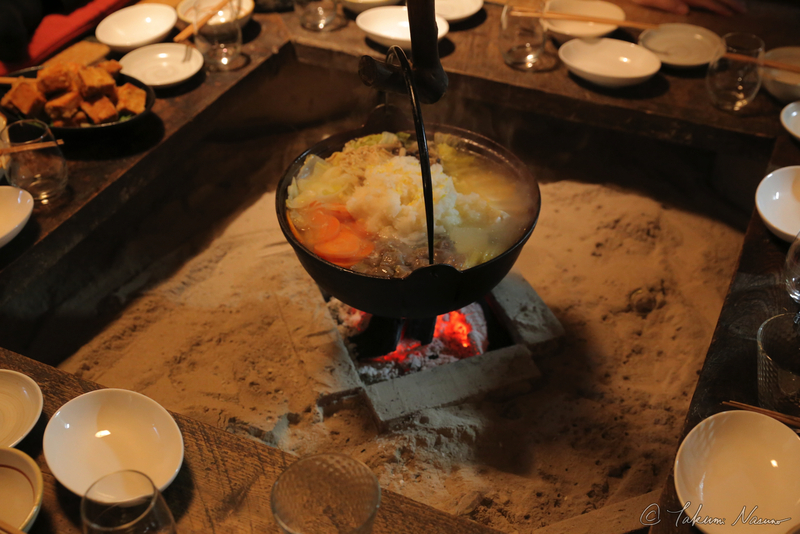 You surround the irori with the other guests and the guesthouse owners and talk over night. There are many people visiting KOZUENOYUKI Guesthouse. They are, as you can easily imagine, very interesting to talk with because they are those who are capable of deciding to come to such an remote area to seek for something. If you really want to experience not trip but life of Japan, KOZUENOYUKI Guesthouse can be the great choice. The last reason is that you can have a chance to communicate only in Japanese because both the master and the owner of KOZUENOYUKI Guesthouse only speak Japanese and they strictly follow the proverb "When in Rome, do as the Romans do". Are you worried that they do not speak your language? Don't worry! Gussan, the master of KOZUENOYUKI Guesthouse, will warmly welcome you in Japanese. If you are capable of speaking Japanese a little and fed up with being spoken to in English during your stay in Japan because of your appearance, or if you are just tough enough to have a will to communicate only by body languages, I strongly recommend this guesthouse to you. 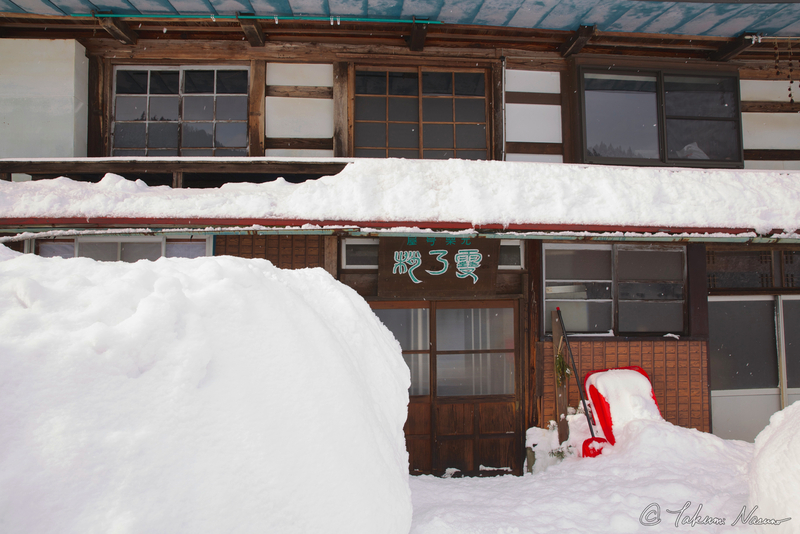 Thanks for reading 7 reasons why you should try KOZUENOYUKI Guesthouse of Otari Village in winter. If you are interested in KOZUENOYUKI Guesthouse, please have a contact through the info below in Japanese.